Rory Skinner will go into the final weekend of the 2018 British Talent Cup with a 12 point championship advantage after a superb weekend in Assen that saw the young Scot take a win and a second place, despite carrying an injury. The recently turned 17-year-old from Perth defied the pain of a broken foot, sustained in a crash just seven days earlier, to win Saturday’s opening race, before missing out on a double by the narrowest of margins in Sunday morning’s second 16-lapper at the legendary Dutch circuit. Again starting from pole position, Rory immediately hit the front and set the pace of the race – pulling fellow title protagonists Max Cook and Thomas Strudwick away from the ferocious battle for fourth pace. Rory put the hammer down and set the fastest lap on the race on lap eight, but despite lowering the lap times to consistent 1:47s, he was unable to shake off the attentions of Cook, who remained within a few tenths of a second of Skinner for the remainder of the race. Despite Rory’s best efforts, Cook made the classic Assen last lap overtaking attempt as went for the lead into the final corner for the last time. Rory was able to carry more corner speed than his rival through the chicane, but the two riders arrived at the apex of the corner on different lines, causing Rory to be pushed wide on the exit. The two crossed the line side by side, with Cook getting the nod by just 0.005 seconds. 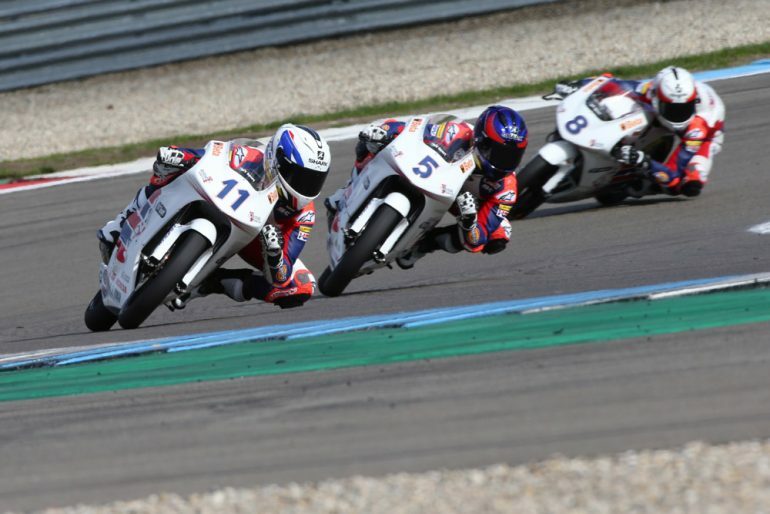 The final two races of the championship take place alongside the final round of the MotoGP world championship, held in Valencia on the weekend of 16-18 November, and the Assen results means that Skinner, Strudwick and Cook all go to the finale with a chance of winning the inaugural British Talent Cup. Rory leads the way on 155 points, with Strudwick on 143 and Cook on 126.